Are you trying to keep your Christmas shopping local this year? Or joining the handmade revolution? Come take a look at this seasonal treasury list I've put together, featuring cool and calm Winter greens and blues. 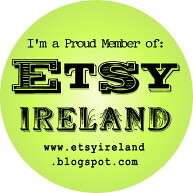 All of these lovely items were created by members of the craftyirelandteam on Etsy, and most have been handmade here in Ireland.